Jalandhar (January 27, 2010): Seeking rule of law and honouring of all commitments –oral and written made by Indian leaders to Sikh Nation at the time of the independence, the Dal Khalsa wrote a letter to Government of India on constitutional and legal discriminations. The delegation of radical Sikh body met the Deputy Commissioner S Ajit Singh Pannu and handed over a copy of the Memorandum addressed to Prime Minister Dr Manmohan Singh to him. Addressing the press conference on the occasion of the 60th republic day, party president H S Dhami and KAC chairman Mohkam Singh said that Indian state has taunted the Sikhs a great deal in every sphere of life, affecting their life, ideals and goals. 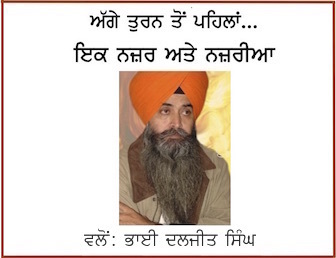 “While India celebrated its 60th republic year, we have no hesitation to place on record that the Indian constitution has failed the Sikh people. The establishment has used the best democratic ideals and institutions, including the constitution to scuttle our religious, social and political aspirations”, reads the letter. The leaders in a memo alleged that implementation of the constitution was invariably according to the whims and fancies of the political parties dominating the life of the people of this country. He said nothing short of the right of self-determination, as accepted by Jawaharlal Nehru would be acceptable to the Sikh people. 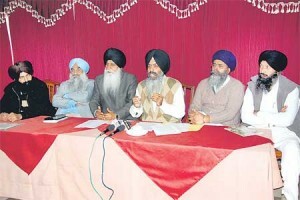 Accompanied by party office bearers including general secretary Dr Manjinder Singh, Mr Dhami enlisted constitutional discriminations against the Sikhs. “In a highly paradoxical situation, we have today a Sikh as the Prime Minister of the India, but Explanation II of Article 25 (2) (b) of the constitution of India still continues to classify the Sikhs as Hindus”, he pointed out. This dubbing of the Sikhs as ‘Hindus’ in the constitution, in spite of a recommendation of the Constitutional Review Committee was the root cause from which flows the legitimacy armed with which all organs of the government continue to discriminate against the Sikhs in various ways. They demanded that Indian state should immediately abrogate Article 25 (2) (b) of the Indian constitution as it violates the fundamental recognition of Sikhs as a separate religion”. “We have had a President and now a prime minister from the Sikh community but even then the Constitutional discrimination continues”. The registration of marriages, adoption, succession, formation of a family business (as is possible for Hindu Undivided Family) -for all these we have to adopt a set of procedures incompatible with our belief systems. This anomaly should be corrected without any agonizing delay. Like Pakistan, the Sikhs in India too need a comprehensive legislation for registration of marriages under the Anand Marriage Act. Indian Parliament has amended the Constitution at least 72 times. 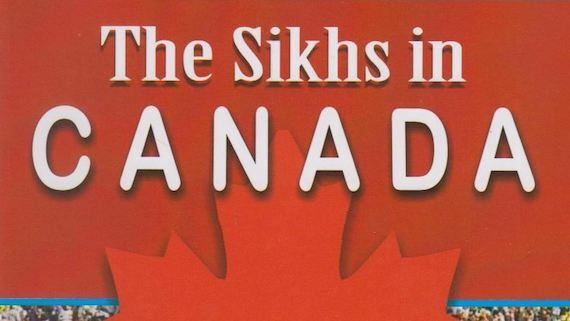 But not once did it considered amending it to grant the Sikh community its due status, they rued. Violating the provisions and clauses of the constitution, thousands of Sikhs have been butchered all over India in the last two and half decades, they pointed out. In a blatant violation of riparian law and basic principles, Punjab has been robbed of its natural resources (river waters) and territory, said Mr Dhami. Dal Khalsa sought exemplary monetary compensation and relinquishment of thousands of acres of land as penalty in lieu of the land and waters of Punjab used by Haryana, Himachal Pradesh and Rajasthan. The party spokesperson Kanwarpal Singh took a dig at government for denying holy city status to Amritsar. “While a number of other cities like Varanasi, Kurukshetra, Rishikesh, Kedarnath, Badrinath and Hardwar have been declared as holy by the so-called secular government of India, they have been steadfast in denying the status of holy city to Amritsar, which houses the Abode of the Almighty”.